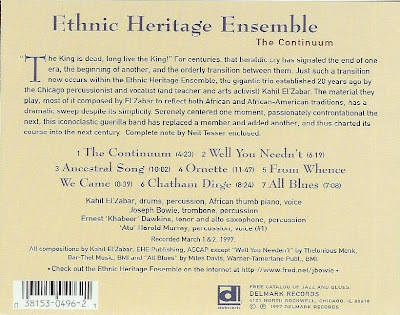 Percussionist/composer Kahil El' Zabar's two ensembles, the Ethnic Heritage Ensemble and Ritual Trio exemplify the AACM's credo: Great black music, ancient to the future, with these two excellent releases. 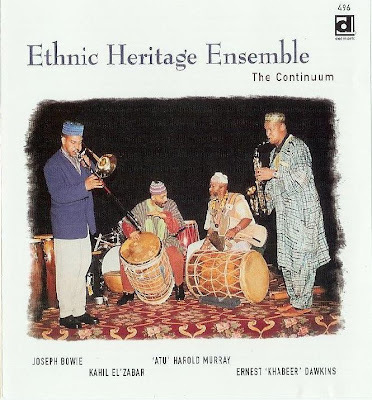 While his 20-year-old Ethnic Heritage Ensemble explores the communal polyrhythms of Africa, the 18-year-old Ritual Trio extends that tradition by engaging in democratic freedom swing. Continuum also amounts to one of the EHE's funkiest and most accessible offerings of recent times. On the thumping "Well, You Needn't," El'Zabar and Murray lay down a head-nodding groove in which Dawkins' peppered alto and Bowie's smearing trombone unleash smothering, yet cogent solos. The same is true for the infectious title track and their imaginative reading of "All Blues." Dawkins' bittersweet tone and economical phrasing offer a nice contrast to Bowie's explosive, and at times effusive outbursts. El'Zabar exhibits a more restrained, yet focused level playing which also heightens the sheer enjoyment of this recording. explosive opening of "From Whence It Came" to the soothing Coltrane tribute, "One For John,"
the Ritual Trio reclaims freedom swing's lyrical essence that is so often obscured by meaningless avant garde clich s. Although El'Zabar's compositions tend to be sparse in design, their simplicity still creates a sense of suspense and excitement.